Broken Teeth: Restore or Replace? Breaking a tooth at the gum line is not an uncommon event. Bite trauma (orthodontic or occlusal issues) can cause breakage as well as normal physical trauma that might be endured in sports activities or accidents. Although a dental implant replacement may be more routinely recommended as the ideal treatment, there are some situations where a thorough prosthodontic assessment of the remaining tooth structure, underlying bone and periodontal attachments may reveal opportunities for a less invasive crown lengthening and restoration. For some patients, the savings in treatment time and cost can be significant. Assuming that bone and periodontal tissue health is good, a critical component for determing how effective and durable a crown lengthening treatment can or will be is the ratio between the height of the restorative crown and the size of the build up and tooth structure. Risk for eventual failure can be high if the buildup prep lacks a specific width and depth. The location and type of tooth also plays a role since some teeth must withstand higher biting pressures and risk for lateral movements during biting and chewing than others. For the patient pictured in this treatment series, it was determined that a dental implant replacement of the broken tooth was not required. 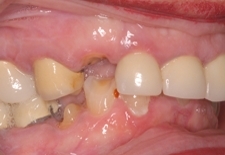 The patient had the option of restoring the remaining tooth structure. Tissue analysis (bone and periodontal) along with occlusal assessments provided the technical data needed to develop and shape the build up core. Subsequent design of the crown assured maintenance of the proper sizing ratio. 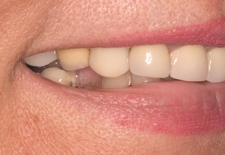 A temporary crown was used to provide the latitude for any final adjustments needed before the permanent porcelain crown was fabricated and placed. Most patients use the temporary for 4 to 6 weeks, providing ample healing time that determines final tissue positioning. This extra attention to detail assures a natural appearance and feel .... in contrast to having a tooth that is an obvious replacement. The temporary also enabled the patient to make the perfect selection of shading she wanted. The final photo in this treatment series displays what can be achieved that meets the objectives of the dentist AND the patient. 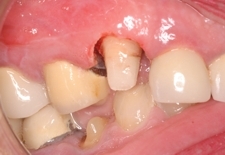 The newly restored tooth has a natural appearance and feel that restored the patient's bite characteristics she had prior to the injury.